This has bothered me ever since I noticed it; the viewscreen in The Next Generation shows perceivable depth even when viewed from an angle when, I would imagine, such an angle should start to warp the image (like with TVs in real life). In the video, he implies that this was all intentional; that the viewscreens were meant to showcase some fancy, futuristic 3D/depth-capable screen technology. Is there really such an in-universe explanation in Star Trek? There's no on-screen canon explanation given. The main viewer display matrix includes omni-holographic display elements and is thus capable of displaying three-dimensional information. In the Star Trek: Voyager episode “Year of Hell,” there is a scene where the viewscreen is offline due to heavy damage to the ship. What's interesting in this is that it is not simply black, like a monitor nowadays when offline, but it has a structure that looks exactly like the wall of Voyager's holodeck. Great theory, but I suggest another reason they depicted the viewscreens as they did: A 2D image of someone looking straight into the camera appears to be looking straight at the viewer regardless of the viewing angle, and this is unnerving. It's the effect of a portrait that seems to stare at you no matter where you are in the room. This may be why portrait artists often pose the subject looking to the side. It's less creepy. A realistic 2D video conversation might have looked like this, which might even make an audience laugh. Current viewing panels are "flat" because each pixel is essentially an omnidirectional lighting element. If you could make each pixel emit light in only one direction (like a laser vs. an LED), then you would only be able to see the screen from one angle. If you can further combine that with being able to emit multiple different pixels at the same physical location, but with different "output angles", then you can make a display that appears "3D". The basics for this sort of thing have actually been around for some time, using a technique called lenticular printing. More recently, there has been work into making interactive displays using the same principles. Presumably, Star Trek is just using an advanced version of something that works on the same idea. Other answers mentioned holodeck technology. I would guess that the walls of the holodeck are doing something like I described, and thus it makes sense to say that the viewscreen is using "holodeck technology". A second interesting observation is that the viewscreen potentially presents a 180 degree FOV's worth of information. Even though this is not visible to someone looking right at the screen from a distance, if you put your cheek right up against the "glass" of the screen you can seemingly see the very corners of the other side's bridge. Below: The blue door, and the control panel with two levers is only visible from the viewer's POV, not the captain's. I think it is obvious from that that at the bare minimum, there is a camera(s) on the other end which has a full hemisphere of viewfield, possibly a full sphere. Given ST's tech level, I would expect there to be an array of scanners and sensors all around the bridge, able to provide a view from any angle at will, and even compose a 3D representation of the scene. On the receiving end, you could use the same technology as in holodecks to reconstruct the scene in a very lifelike matter. One thing that always concerned me is the security implications of showing foreign military personnel an image of your starship's bridge. 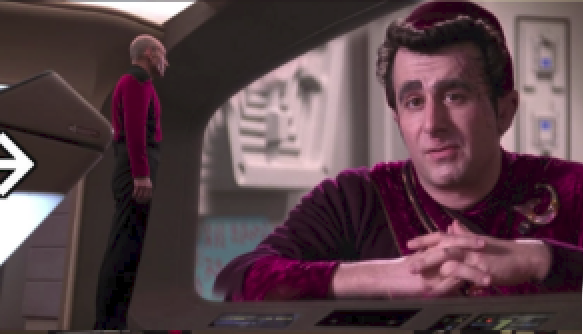 Especially with ST's tech, it shouldn't be hard to edit the video stream online and insert a generic bridge background scene behind the captain. Perhaps this is already happening in the usual case: You could imagine that the comms equipment defaults to transmitting the of the speaker, and the receiving equipment automatically fills in the missing background with a standard scene. As far as I can remember, they never gave any kind of explanation in-universe for how the viewscreens work. A pretty simple speculative in-universe explanation is that it uses roughly the same technology as the holodeck. 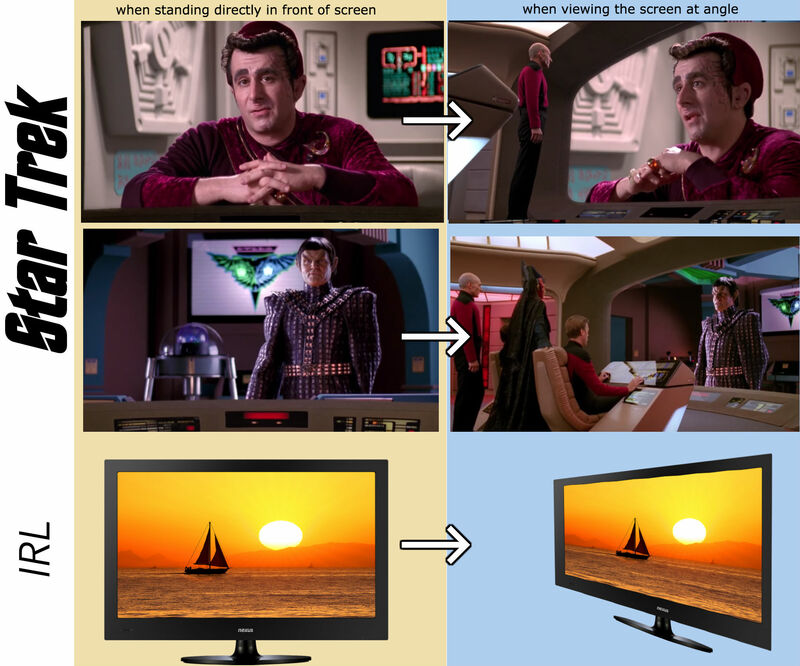 It's already a technology that exists on the Enterprise, and the viewscreen wouldn't have to really be as complicated since nobody has to interact with it physically. I'm not aware of any explanation that's been given in-universe, though. We already have this technology. Since 1901. Not the answer you're looking for? Browse other questions tagged star-trek star-trek-tng technology . How many Star Trek species possess 'mega-strength'? Did any Nanites ever show up in any Star Trek stories after Evolution?